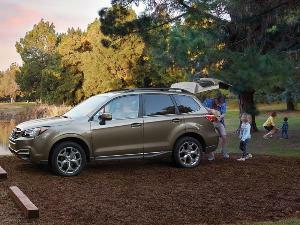 The newest nameplate to join Ford’s extensive lineup of SUVs and crossovers is also its smallest. Sold in other markets around the world for more than a decade, the 2019 Ford EcoSport is now in U.S. showrooms. The diminutive Ford EcoSport is derived from the same B-segment global platform as the Fiesta subcompact car and hails all the way from Chennai, India. Starting at $20,990 (including the $995 destination charge) the 2019 EcoSport lineup includes the base S, volume-leader $23,900 SE, luxurious $26,235 Titanium, and sporty $27,235 SES. 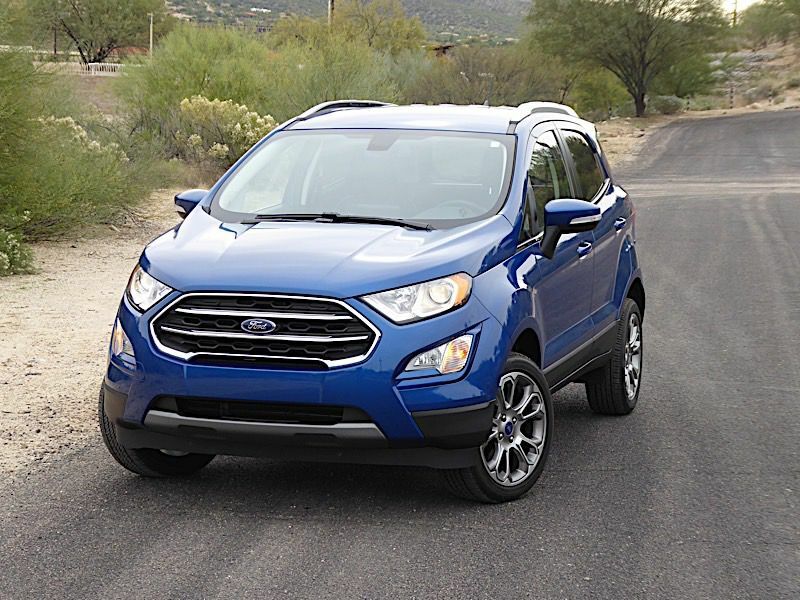 The EcoSport S, SE, and Titanium come standard with front-wheel drive with all-wheel drive as an extra-cost option. 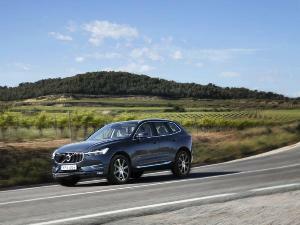 The SES is available only with all-wheel drive. The EcoSport’s small scale is really obvious when you view it in profile. 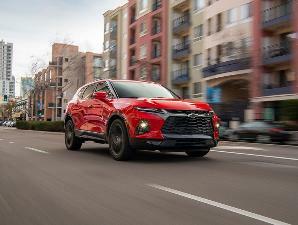 The junior Ford suv is nearly a foot and a half shorter bumper to bumper than the compact Ford Escape and a whopping 5.5 feet more abbreviated nose to tail than Ford’s biggest SUV, the Expedition MAX. That size enables the EcoSport to squeeze through heavier clumps of traffic and make use of the tight parking spaces most SUVs would have to pass up. 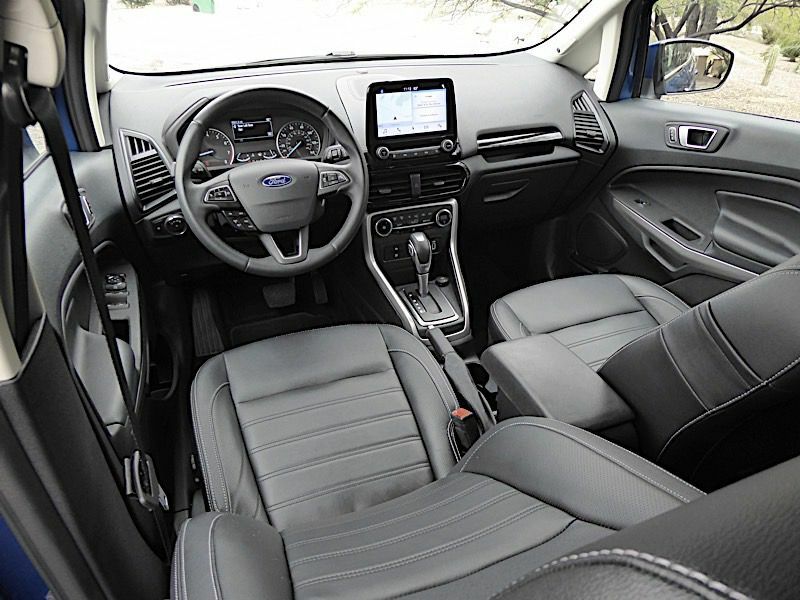 Ford figures that’s exactly what a growing number of younger urban-dwellers are looking for — a tall hatchback with street smarts, an elevated driving position, and a just-roomy-enough cabin and cargo hold that just happens to share styling cues with larger SUVs. While it may be small on the outside, the EcoSport doesn’t skimp inside. The base EcoSport S is no stripper, offering standard air conditioning, eight cupholders, a tilt/telescope steering column, automatic headlamps, a pair of smart-charge USB ports, and a backup camera. Moving up to the volume-leader $23,900 SE brings a standard power moonroof, automatic climate control, a power driver’s seat, heated front seats, privacy glass, a windshield wiper de-icer, leather-wrapped steering wheel and shifter, push-button start, and a reverse sensing system. The range-topping $26,235 Titanium adds leather front seats and a sliding center armrest, plus blind-spot and rear cross-traffic monitoring. And the sporty $27,235 SES includes a 110-volt power outlet, ambient interior lighting, faux-leather seating, an auto-dimming rearview mirror, rain-sensing wipers, and a sport suspension. All-wheel drive versions of the S, SE, and Titanium are about $2,000 pricier than front-drive iterations. Ready for the sounds of the city, the EcoSport S rolls with standard voice-activated SYNC, a six-speaker AM/FM/MP3 stereo with a 4.2-inch infotainment display. 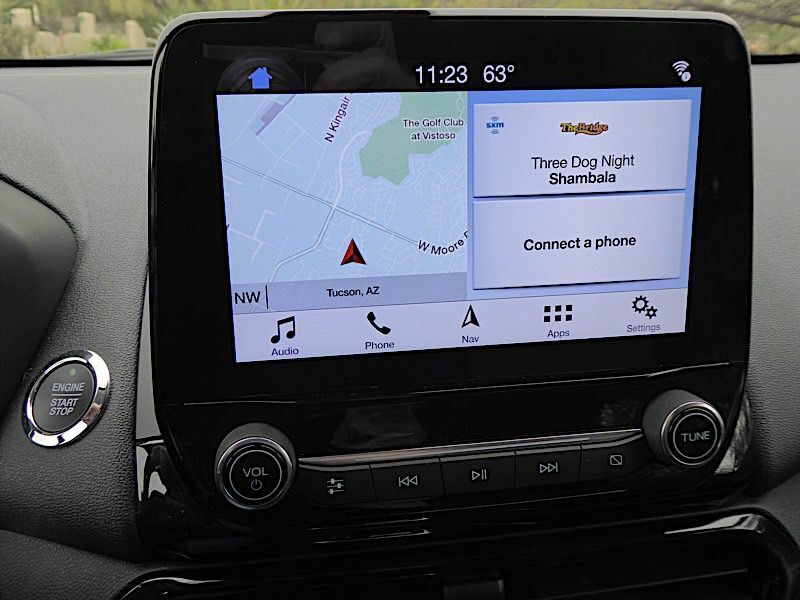 The SE adds SYNC 3 with a 6-inch touchscreen, Apple CarPlay and Android Auto compatibility, and SiriusXM satellite radio. The SES brings FordPass Connect 4G in-car Wi-Fi for up to 10 devices, an 8-inch touchscreen with voice-activated navigation and a 7-speaker audio system. The Titanium upgrades to a nine-speaker B&O sound system by Bang & Olufsen, and HD radio. Despite the EcoSport’s small-car footprint, it’s got the SUV height advantage working for it, lording roughly 7 inches over the Fiesta. That brings a slightly elevated driving position that SUV buyers crave and nearly as much headroom as in the larger Escape. Five passengers can fit in a pinch, but four is the practical limit for longer trips if the rear-seaters are to remain friends. Adjustable lumbar is standard equipment for the driver’s seat. All of the seats are on the firm side, offering an acceptable blend of comfort and support. 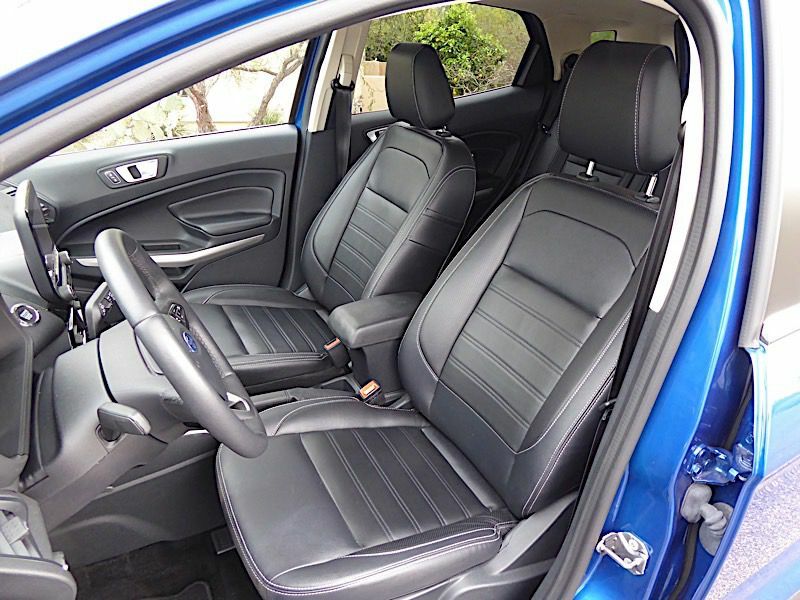 The EcoSport’s rear-seat headroom is reasonable for adults. Legroom back there is tight, however, and six-footers will have to negotiate a few inches of knee space from the front-seat occupants to keep the peace — or ride side-saddle. The rear seatback is split 60/40, allowing seating for one rear passenger while folding down the other side to allow additional cargo room or to accommodate longer items. 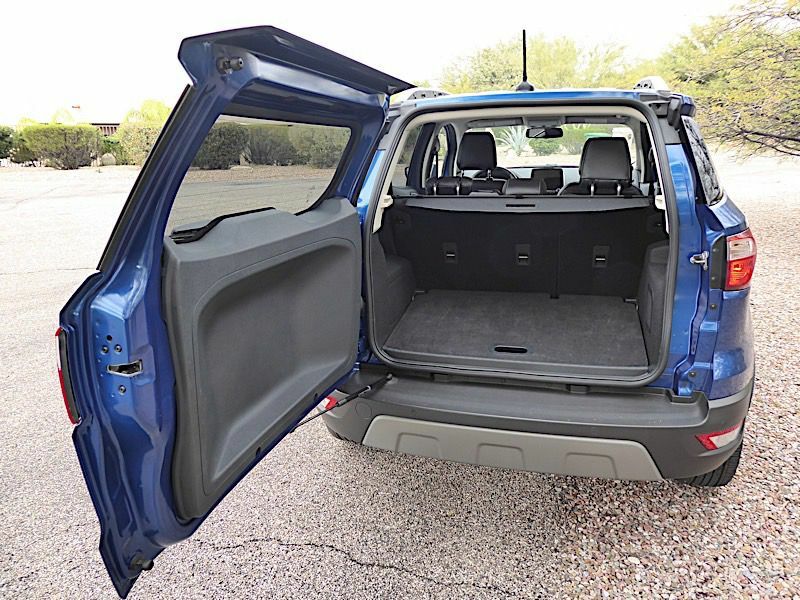 Not unlike older design SUVs such as the first-generation Toyota RAV4, the EcoSport’s cargo door pivots open to the curb side. The EcoSport does not have a liftgate as is typical of most modern SUVs and hatchbacks. 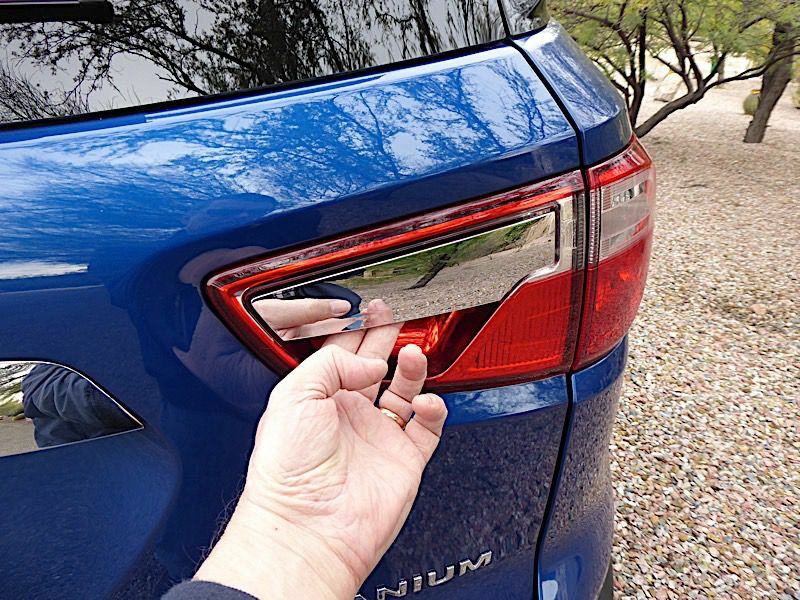 Ford cleverly integrated the latch switch and pull handle for the swing-out rear door into the passenger side taillamp housing, which will likely have a few new owners consulting the operator’s manual the first time they try to open it. 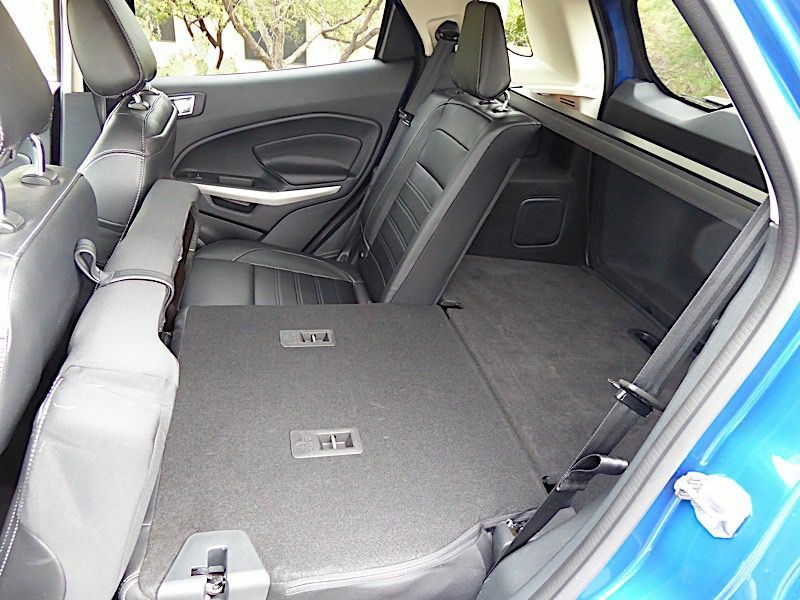 Aft of the rear seat, the cargo space behind the rear seat is about a third less than the Escape’s. On the other hand, the EcoSport’s 20.9 cubic feet of cargo room is roughly equivalent to that in a full-size sedan’s trunk or the space behind the third-row seats of the much larger SUVs such as Ford’s own Expedition, Explorer, or Flex. The cargo space expands nicely to 50 cubic feet — more, say, than what's available in the slightly larger Buick Encore or Chevrolet Trax — but in order for the rear seatbacks to fold flat, you must first flip forward the rear seat's bottom cushions. 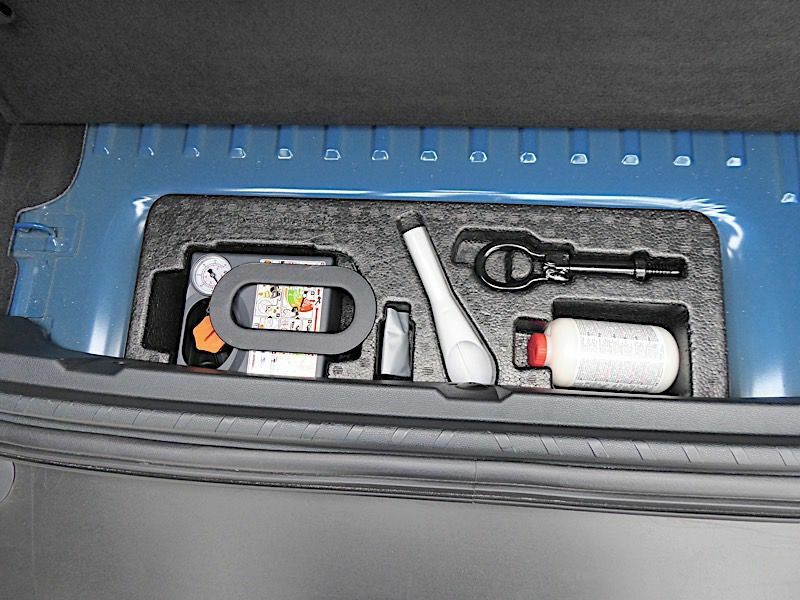 There’s also a standard cargo management system that consists of hidden underfloor storage and an adjustable cargo-area shelf. For EcoSports sold in other parts of the world, the rear door carries a full-size spare tire outside. U.S. versions eliminate the spare, improving rearward visibility a bit, and instead provide a tire inflator kit with sealant goop. 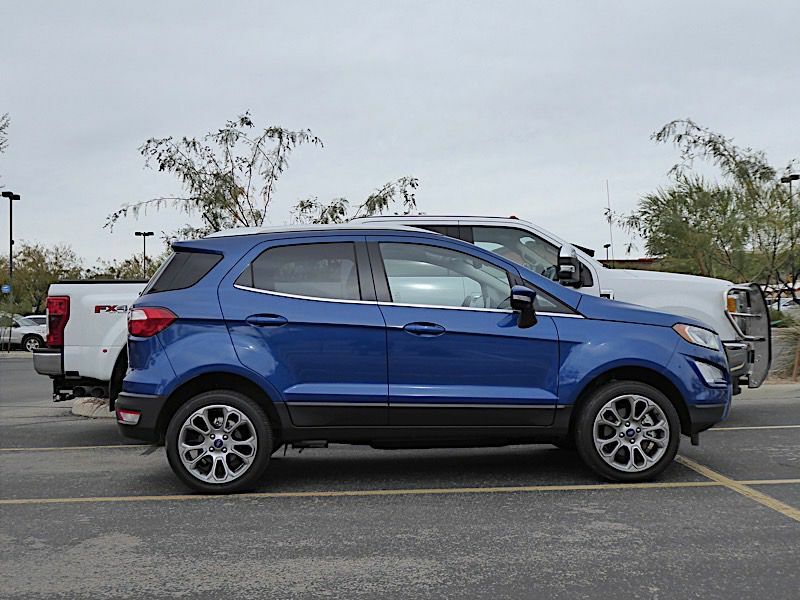 Ford made a dealer-installed accessory rear door-mounted spare tire available for 2018 models, but a low take rate caused the company to drop the option for 2019. Tip: keep your cellphone charged and sign up for a good roadside assistance plan. There is no spare tire on board. 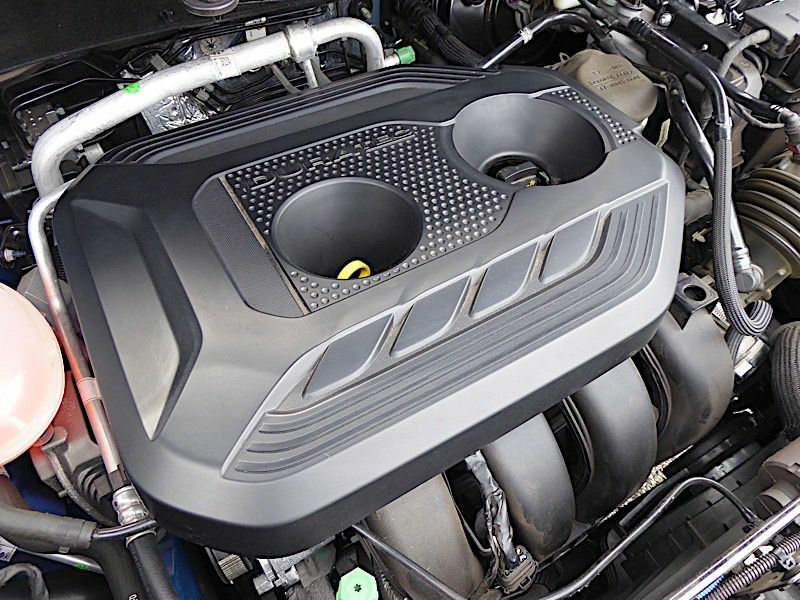 The base powerplant on the EcoSport S, SE, and Titanium is a 123-horsepower 1.0-liter turbocharged three-cylinder engine with 125 lb-ft of torque. 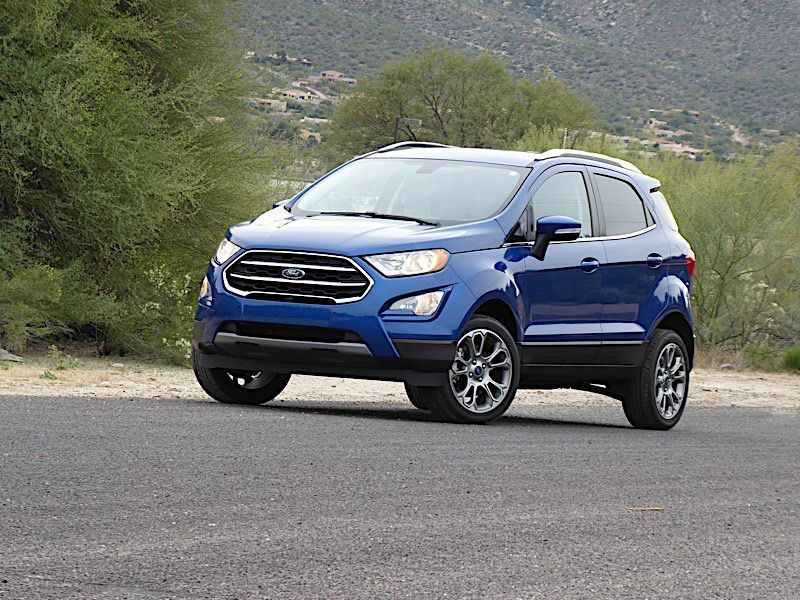 Available only with front-wheel drive and a six-speed automatic transmission, the three-cylinder works well enough to motivate the 3,000-lb EcoSport in an urban environment. And despite having an odd number of cylinders, the 1.0-liter is surprisingly smooth. 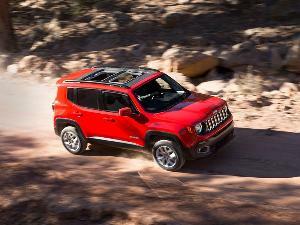 With EPA-estimated fuel economy of 27 mpg in the city, 29 mpg on the highway, and 28 mpg combined, however, the 1.0-liter’s efficiency is nothing to write home about. A better choice and standard on the sporty SES model plus required with any EcoSport equipped with on-demand all-wheel drive is the 2.0-liter four-cylinder. This naturally aspirated engine (not a turbo) punches 166 hp and 149 lb-ft of torque and also uses the six-speed automatic. The 2.0-liter is EPA-rated at 23 mpg city/29 mpg hwy/25 mpg combined, which again isn’t great considering the EcoSport’s tiny size. I saw indicated average fuel economy in the high 20s. A standard stop-start system automatically shuts off the engine at idle. It restarts when the driver lifts a foot off the gas pedal. Ford has at long last entered the rapidly expanding mini-SUV market segment, which in 2018 will approach 700,000 annual sales in the U.S. The EcoSport joins the ranks of the Hyundai Kona, Kia Soul, Chevrolet Trax, Nissan Kicks, Nissan Rogue Sport, Honda HR-V, Subaru Crosstrek, Mazda CX-3, Buick Encore, Jeep Renegade, Toyota C-HR, Mitsubishi Outlander Sport, Fiat 500X, and Lexus UX. 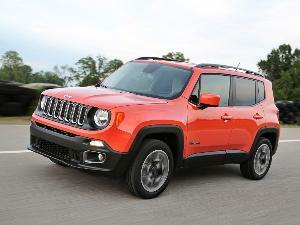 Still more small SUV entries are pending from both mainstream and luxury brands. As Ford announces plans to phase out sales of most of its passenger cars and all of its small hatchbacks and sedans in the U.S. over the next few years, the importance of offering small, affordable crossovers and SUVs such as the EcoSport to draw entry-level and first-time buyers to the Ford brand becomes ever more important. 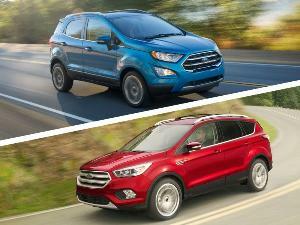 2018 Ford EcoSport vs. 2018 Ford Escape: Which is for you?